I was just starting to get excited about Easter, when the folks at Favor Affair reminded me that graduation isn’t all that far off for some of us and those planning any sort of graduation festivities better get planning (don’t worry, back to Easter and birthday parties, soon). 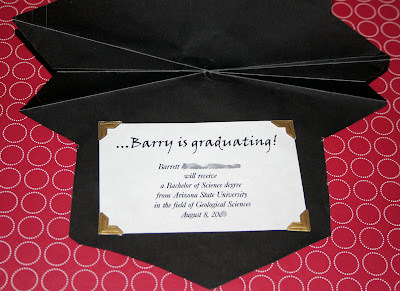 So I dug up the announcements I made when my husband graduated from college a few years back. I was SO excited for him to graduate, that I made probably 30+ of these by hand. Please excuse all of the wrinkles, they are a few years old. It took a bit of trial and error, but I finally figured out a way to cut and fold them into the shape of a graduation cap. I love you all so much that I spent all afternoon making a template for you, incase you are as excited about graduation and as insane as I was, and want to make your own. Unfortunately, I can’t figure out how to post .pdf files. So as soon as one of my lovely and intelligent readers, leaves me a comment with the downlow, I will put that up for you. I just used black scrapbook paper, a marker to trace the brim of the hat on the front, and a gold paint pen to draw the tassle and words on the black. I also used gold photo corners to frame the information (much like you would find in a diploma!). UPDATE: You can download the template here. So what does this have to do with Favor Affair, the store with all of the cute party favors and accessories? Well, they wanted me to show my readers some of their cool graduation party favors, and in return they are giving one of you a $25 gift certificate to spend on anything at their store! Yea for you! Of course, graduation doesn’t have to be all pomp and circumstance. I think these suitcases are adorable and will be used in some party I throw in the future. They would make a fun party favor (sending the graduate of on their journey through life). Or why not throw a luau or other themed party. I think it is particularly great when parents or community members come together to throw an after-graduation party for high school students that gives them a safe place to celebrate with out the temptation to drink or get into other trouble. 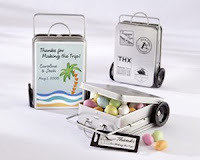 Who could resist a cool luau with fun favors like these? For more graduation favors go here. 1-For one entry go to Favor Affair and look at their ideas for graduation favors. Come back here and leave a comment telling me which one you would use and how. 2-I know not all of us will be celebrating a graduation this year, so for a second entry, go to Favor Affair and pick whatever item you’d be most likely to use your $25 to purchase (besides graduation). What parties and events do you have coming up? 3-And just because I really love my followers, if you follow my blog, leave me a third comment telling me so and you get a third entry! 3 chances to win! The giveaway will run until midnight Sunday (well, I guess that would be Monday morning, but you know what I mean)! I will announce the winner sometime Monday! Good Luck! And congratulations all of you graduates! P.S. 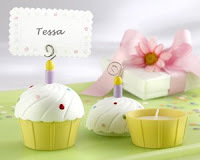 I had to show you this cute birthday candle. Did you notice the name on the card. Do you think there is anyway that they were inspired by this party??? I don’t have anyone graduating this year but my daughter graduated in 2007 and I would have loved to have “Graduations” Antique-Finish Photo Frame/Place Card Holder to give to some of her classmates! I’m all for a girl’s night out! I really like the “The Cosmopolitan” Monogrammed 5-Piece Manicure Set! i love love love the cupcake and ice cream cones!!! oh and i just starting following your blog! mine is kinda new and everything about it is new to me. Just wanted to say how much I love your graduation cap invitation!! I just found you blog and love it! I’m now a follower. Thanks! I would get “About to Pop!” Popcorn Favor Box. I love all parties and showers but baby showers are my favorite. I love this party favor idea! I don’t have anyone to throw a graduation party for… but I when I saw the “Unexpected Treasures!” I came up with a great idea. I would use these for my own children after they graduate from each grade. Just something small inside to say GOOD JOB! What a lovely blog you have. Party hopping from UBP 09 and participating too so stop in for a visit. “Sweet Success” Graduation Chocolate Bars. My sister would love these for he graduation this year. The Nest Egg” Scented Soap I love these, I am throwing my friend a baby shower and the theme is baby birdies. Too cute! I love following your blog, You always come up with so many creative ideas. Thanks! for graduation i like the personalized candy bars, having the pic of the graduate is so cute. other things i thought were adoreable are the “about to pop” and “about to hatch” i love baby shower ideas and these were so cute!! 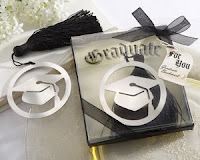 I really like the graduation surprise tin boxes with the labels you can customize.. love the bows! We don’t have any graduation parties coming up so I was looking at the fairy tale and princess things since I’m sure my daughter would love to have a princess party and we have a lot of tea parties through the year. I loved so mamy things!! My favorites were the princess themed place card holders, the carriage shaped favor boxes, and the tea kettle place cards. Because I don’t have a graduation to prepare for this year…I would pick the “About to hatch” favors. They are completely adorable and I can see a whole Baby shower planned around that one favor! 1. I love the “Miles of Memories” suitcases – those are cute. You could do lots of things with those for graduation. Kind of the whole “Oh the Places You’ll Go” theme. 2. I was going to go with the “Enchanted Carriage” favor boxes, but I think I like the “Fleur-de-Lis” place card holders most – you can use those more often. So pretty! 3. Of COURSE I follow you! Hmmm… Was I supposed to do three *separate* comments? Sorry. Yes, Kameron, you were supposed to do three seperate comments, so your comment can be numbered and counted as your entry. But don’t worry! My response to your comments can count as your entry #3! I don’t have anyone graduating this year unfortunately. If I did though, the cute picture frames would make great keepsakes for grandparents! One of my best friends is getting married this summer, I LOVE all of the cute favors for bridal showers and girls night out! Because I don’t have a graduation in the near future I would choose either the coast frames to give out for my nieces 1st birthday or the bag holder to hand out at our fall girls weekend away. I have been reading your blog for several months now, but I wasn’t a follower until today. This is a great give away, thanks for sharing. “The Cosmopolitan” Monogrammed Koozie Love these for a girls nite out sooN! Do you have the PDF template for this hat invitation? I am getting ready to make my cousins invites and this is almost exactly what she wanted.